Line crews are battling downed trees across the service area, cutting their way into roadways and driveways to reach damaged parts of the electric system to restore power to a remaining 2,156 members as of 3:30 pm Friday. Blue Ridge Energy and assisting line crews and tree contractors will continue working this evening and through the night if necessary in efforts to restore power to members impacted by Thursday’s ice storm and last night’s wind gusts. 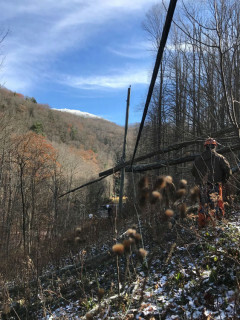 Ashe, Alleghany and Watauga counties experienced many downed trees and large limbs, causing damage to nearly 250 different locations of the cooperative’s electric system. Nearly 12,000 members have been impacted since Thursday. Currently without power as of 3:30 pm Friday: 1,484 in Ashe County; 600 in Alleghany County; 69 in Watauga County; and 3 in Wilkes County. 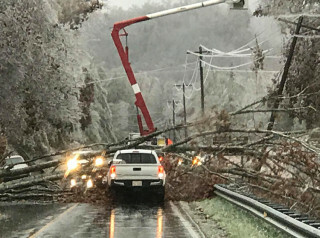 Overnight winds coupled with Thursday’s ice storm left widespread damage, impacting thousands of Blue Ridge Energy members. Blue Ridge Energy thanks the line technicians and contract tree crews assisting the cooperative’s line technicians, including: Carter Tree Service, Sumter Utilities, Inc., Asplundh Tree Expert Co., Rutherford Electric Membership Corporation, EnergyUnited, Union Power Cooperative, Randolph Electric Membership Corporation, and Surry Yadkin Electric Membership Corporation.